The sixth scientific expedition to the Aknīste, Nereta and Ventspils districts in 1952. The collection consists of 5661 folklore material units and other data, collected by 18 participants of the expedition. About 600 units were considered soviet folklore (including 125 revolutionary songs of 1905); the rest represents traditional genres, as usually dominated by folksongs, riddles and proverbs. That was the first pan-Baltic, centralized, multidisciplinary expedition supervised by the Institute of Ethnography at the USSR Academy of Science. However, the process of collecting folklore did not generally differ from previous expeditions. 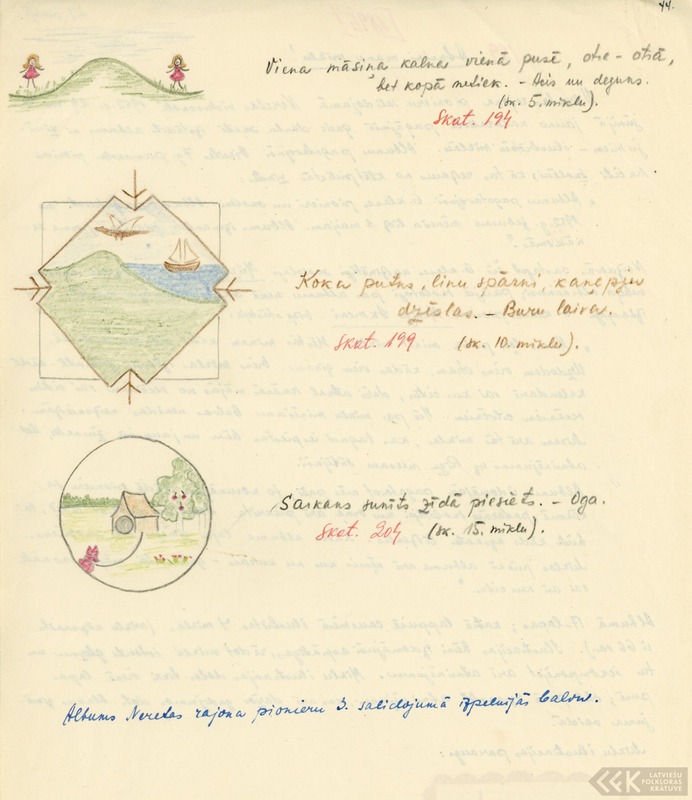 This collection  is the second of two containing fieldwork diaries; here fourteen diaries represent 745 pages of notes. The collection demonstrates an increased interest in amateur poetry and efforts to create popular songs on its basis. The collection includes about 100 photos and 21 sound recordings as well. Rather rare are materials of fishermen folklore from Ventspils district. מציג 1-20 מתוך 48 רשומות. Students with folklore informants Foto 19520012 1952 Students recording folklore from informants in the district of Nereta. From left: 1. Karlīne Valdemara 2. Anna Dāboliņa 3. Valentīna Eisule 4. Laima Biemelte. Folk narrator Karlīne Valdemara and student Foto 19520014 1952 Latvijas Zinātņu akadēmijas Etnogrāfijas un folkloras institūta 6. zinātniskā ekspedīcija 1952. gadā. Studente Lūcija Biemelte ar teicēju Karlīni Valdemaru Neretā. The folklore informant Betija Dzene Foto 19520015 1952 The folklore informant Betija Dzene from Nereta district. The gathering of pioneers Foto 19520016 1952 Nodarbības pionieru salidojumā Neretā 1952. gadā. The gathering of pioneers Foto 19520017 1952 Nodarbības pionieru salidojumā Neretā 1952. gadā. The gathering of pioneers Foto 19520018 1952 Nodarbības pionieru salidojumā Neretā 1952. gadā. The folklore informant Anna Ukuliņa Foto 19520019 1952 The visiting session of the Institute of Ethnography and Folklore at Nereta on 13 July, 1952. Folk singer Anna Ukuliņa performs some songs. The folklore informant Jūlija Kraševska Foto 19520020 1952 The folklore informant Jūlija Kraševska and folklorist Rita Drīzule. Dance group of Nereta Foto 19520021 1952 The Nereta dance goup that performed folk dances and their own creation "Neretietis". Dance group of Nereta Foto 19520022 1952 The Nereta dance goup that performed folk dances and their own creation "Neretietis". Collective farm workers at the concert Foto 19520023 1952 Collective farm workers from the Nereta district at the concert. From the left: 1. Betija Dzene 2. Staņislava Skutāne 3. Emīlija Lejniece 4. Pēteris Kadžulis 5. J. Bīnāts. Collective farm workers at the concert Foto 19520024 1952 Collective farm workers from the Nereta district at the concert. From the left: 1. Emīlija Lejniece 2. J. Bīnāts 3. Jānis Zālītis 4. Betija Dzene. Collective farm workers at the concert Foto 19520025 1952 Collective farmers from the Nereta district at the concert. Zasa village dance group Foto 19520026 1952 Zasa village dance group performing dances created on their own at the session concert. Zasa village dance group Foto 19520027 1952 Zasa village dance group performing dances created on their own at the session concert. מציג 1-20 מתוך 24 רשומות. מציג 1-20 מתוך 2,376 רשומות.